A stunning collector's edition of the acclaimed novel from the #1 New York Times bestselling author V.E. Schwab. With an exclusive metallic ink cover, this edition will feature: * End papers of London * Fan art * A glossary of Arnesian and Antari terms * An interview between author and editor * Original (never before seen!) 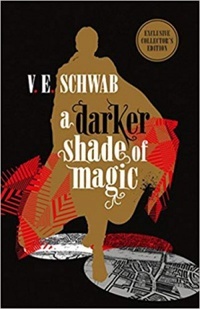 tales from within the Shades of Magic world Kell is one of the last Antari-magicians with a rare, coveted ability to travel between parallel Londons. There is Red London, where life and magic are revered, Grey London, without magic and ruled by mad King George III, and White London, a city slowly being drained through magical war, down to its very bones. And once upon a time, there was Black London... but no one speaks of that now. Officially, Kell acts as an ambassador and messenger between the Londons, in service of the Maresh Empire. Unofficially, he's also a smuggler, a defiant hobby with dangerous consequences-as proved when he stumbles into a setup with a forbidden token from Black London. Fleeing into Grey London, Kell runs afoul of Delilah Bard, a cutpurse with lofty aspirations. She first robs him, then saves him from a deadly enemy, and finally forces Kell to spirit her to another world for a proper adventure. But perilous magic is afoot, and treachery lurks at every turn. To save all of the worlds, they'll first need to stay alive... Prepare to be dazzled by a world of parallel Londons-where magic thrives, starves, or lies forgotten, and where power can destroy just as quickly as it can create.